Model 4231 Single Arch Polyester Reinforced Chlorobutyl Connectors are designed for demanding industrial applications in process piping systems, power generation, water and wastewater systems. These wire reinforced, molded arch connectors absorb pipe movement and stress, reduce system noise and vibration, compensate for piping misalignment, eliminate electrolysis, and protect against start-up surge forces. They are most effective when installed parallel to the rotating shaft of equipment. If the piping is not anchored and supported, control units MUST BE Installed to prevent hyper-extension of the connector due to system pressure thrust. 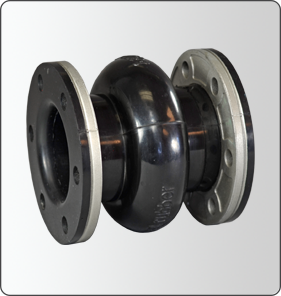 Spool type arch connectors are molded with a full face rubber flange and furnished with steel flange back-up retaining rings and separately packed, field-installed control rod sets. They are available with a soft rubber arch filler to prevent the collection of solids in the arch, but this arch filler will reduce the movement of the joint.